I was reading an article in a newspaper which mentioned how in China there is a belief that an invisible red thread connects the important people in our lives. There are various variations on this theme: the red thread links us to the person we should marry or links us to the child destined to be ours, either naturally or through adoption. With the second of these variations there is an interesting story about the writer, Ann Hood, whose daughter, Grace, tragically died at the age of five. Ann went through the agonies of losing a child, but three years later the idea developed within her that she should adopt a baby from China. The procedures for doing so were followed and eventually she received notification that a child had been found for her and her husband. The social worker handling the adoption gave Ann the details, "She's healthy and she's nine months old, born on the 18th of April." This was a shock, as the 18th of April was the day that Grace had died. Fate, destiny, synchronicity, coincidence, call it what you will, but since then Ann has found similar examples over and over. Her niece's baby boy was born on her grandfathers birthday. She found that her friend had chosen the 6th of September as her wedding day, without realising that this was also the day her grandparents had married. Even in the group of ten families who travelled with her to China, three of the adopted babies had the same birthdays as those of deceased members of their new families. "One story featuring the red string of fate involves a young boy. Walking home one night, a young boy sees an old man (Yue Xia Lao) standing beneath the moonlight. The man explains to the boy that he is attached to his destined wife by a red thread. Yue Xia Lao shows the boy the young girl who is destined to be his wife. Being young and having no interest in having a wife, the young boy picks up a rock and throws it at the girl, running away. Many years later, when the boy has grown into a young man, his parents arrange a wedding for him. On the night of his wedding, his wife waits for him in their bedroom, with the traditional veil covering her face. Raising it, the man is delighted to find that his wife is one of the great beauties of his village. However, she wears an adornment on her eyebrow. He asks her why she wears it and she responds that when she was a young girl, a boy threw a rock at her that struck her, leaving a scar on her eyebrow. She self-consciously wears the adornment to cover it up. The woman is, in fact, the same young girl connected to the man by the red thread shown to him by Yue Xia Lao back in his childhood, showing that they were connected by the red string of fate." It's not only soul mates or children who are connected in this way. It is often said in China that when a baby is born, he or she is already connected to the important people in his or her life. As each birthday passes the threads shorten and tighten, bringing together those who are fated to be together. 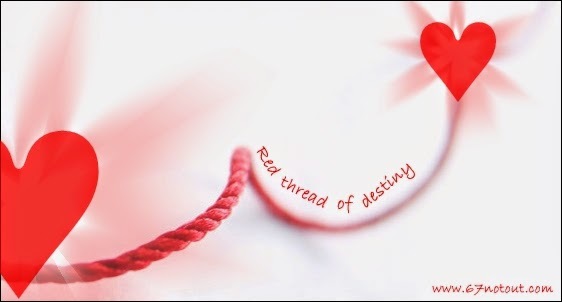 Others say that the red thread connects not just people from the present, but also those from the past and the future. The thread may tangle or knot but it never breaks. Perhaps we are connected to some people for eternity. Mike, I found this to be very interesting. Several years ago a young couple I know was in the process of adopting a child from China. Before they made the long journey to China to bring her home, they had each of their friends provide a small square of fabric and a brief, written explanation of who we were. The fabrics were sewn together to make a quilt, representing the connections of the friends who supported the family, their journey to parenthood and their child throughout her life. At a certain age, the child would receive the names, information and associated left-over scraps in order to learn about the quilt. I suspect this all had something to do with the concept of the thread and the connections in one's life. Wonderful story! The synchronicity of dates may be more common than we think and certainly support this idea of the red thread! I love the idea of the Red Thread and have often thought about wearing a red Kabbalah string on my wrist to represent this Chinese view of destiny rather than the Kabbalah string's reason for wearing it.Maybe a red finger string might be a better idea and that way when people ask me about the ring I could inform them of the Chinese legend.I have written a few posts about the Red String on my blog over the years,too. I promise this true, but I've been considering making a red thread for my wrist, similar to the Kabbalah version. I'll re-read your red-thread posts.